Sell My Motorbike - Sell My Bike Today? - Sell My Motorbike? Best Bike Buyer - Sell My Motorbike? If you are thinking of selling your motorbike then Best Bike Buyer can help you. 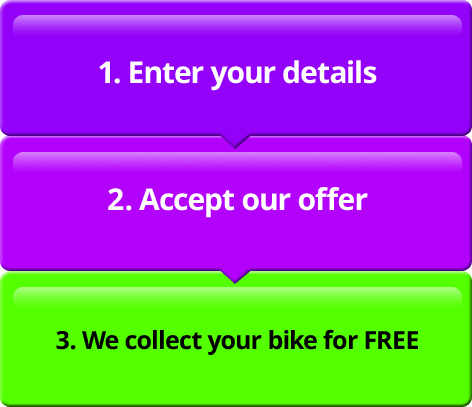 It is a fast and convenient way of selling your bike, simply input your bike details to sell my motorbike and we will value your motorbike and give you an offer. If you accept, Best Bike Buyer will collect your motorbike at your convenience for free. There are many avenues you can take when you come to selling your motorbike, and Best Bike Buyer is one of many on-line motorbike dealers. We think we are are one of the best though, when it comes to service, read why you will get a better service when you sell my motorbike to Best Bike Buyer on our about us page. 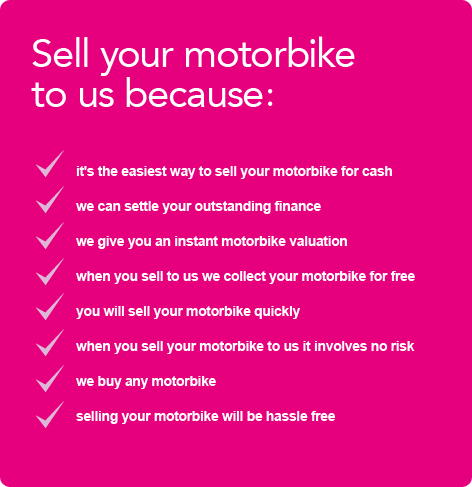 You are not obliged to sell your motorbike to us if you don't want to, you can simply get a motorbike valuation and see how much you bike is worth. How Do I Sell My Motorbike? While you are thinking "sell my motorbike?" some questions may occur to you, in which case you should consult our sell my motorbike frequently asked questions page. There are no catches when you sell your motorbike to Best Bike Buyer. We lay out all our terms and conditions clearly for you on the selling my motorbike terms and conditions page. If you have concerns about your privacy and how the information Best Bike Buyer ask from you is used this is clearly explained on our selling a motorbike on-line privacy page. Who Do I Contact When I Sell My Motorbike? If while you try to sell you motorbike on-line you have any other questions that are not answered on the Best Bike Buyer website then you can contact us on the Best Bike Buyer contact page. Who Will Buy My Damaged Motorcycle? Who will buy my motorbike now the engine has failed?! Try us. Selling your motorcycle with an engine failure isn’t as hard as you might think. We buy damaged motorbikes with engine faults and MOT failures. So if your bike has been in a motorbike accident and is a write off, you can still make money on it! Can I still sell my damaged motorbike? Will anyone buy a broken bike with an engine failure? YES! Best Bike Buyer will.